Liz Kappel and Jennifer Alderman will host the January meeting. Together they will present the BAG Quadricentennial Book Project. Members of our guild will create a collaborative flag book to be displayed at The Echo Center during the 400th Anniversary of the naming of Lake Champlain by Samuel de Champlain, a year-long celebration that begins next summer. The theme of the book is Vermont: The Lake, The Land and The People; Liz and Jen will present the criteria, with page samples for this book challenge. Come to the meeting and find out more about the Quadricentennial and how you can participate in the project. In addition there will be time for sharing “good things” that you have discovered for bookmaking. Bring along a resource book or two, a new tool, a favorite material, a glue technique, paper supply, pop-up structure, or a project you are working on…… whatever you have that you can share for a good old fashioned “Show and Tell”. Our holiday ethnic potluck with the ‘swap & sale’ was as festive as ever. The evening started with an amazing buffet and dessert selection. 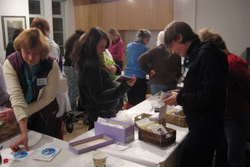 Then members set up mini “shops” featuring artwork, hand-made books, cards, home-grown teas, craft supplies, jewelry, etc. made available for free, for sale or offered in a swap. Conversations and laughter filled the room as members made deals for gift-giving and creativity. *** Although this notice is late, consider applying for Open Studio Weekend over Memorial Day weekend 2009 (or investigating it for future years!). Information and applications are at the following links: http://www.vermontcrafts.com/OSW/OSWForm.html. *** The Garage Annex School for Book Arts has announced their workshop schedule for 2009: http://www.garageannexschool.com/index.php/gas/workshops/. You can sign up to receive occasional Email announcements by sending them an Email: contact@garageannexschool.com. *** If you have a website and/or blog that showcases your creative work, we’d love to share it on the member links page of the B.A.G. blog. Send an Email with the details to Tech Schmoe Elissa Campbell: erscampbell@hotmail.com.